We Say Goodbye to Sr. Francis de Sales Taggart, O.P. Sister M. Francis de Sales Taggart, O.P. 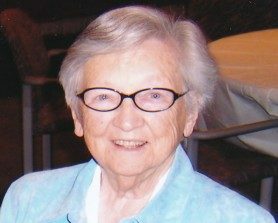 Sister Francis de Sales Taggart, a Dominican Sister of San Rafael, died on May 8 at Our Lady of Lourdes Convent in San Rafael. Born on September 2, 1919 in San Francisco, she attended Dominican Convent Upper School and graduated from the University of California at Berkeley with a degree in history. She spent the World War II years at Pan American World Airways on Treasure Island. After taking the Foreign Service exam, she was assigned to North Africa, where she worked for the Department of State. Upon her return to the United States, she worked for the CIA. Then she turned to her first love, the Dominicans, and became a sister in San Rafael. Sister Francis de Sales taught school for many years in California and Nevada, and later served as Coordinator of Distinguished Lecturers and Planning Giving Officer at Dominican College. A funeral Mass will be held on Monday, May 16 at 10:00 a.m. at the Dominican Sisters Center, 1520 Grand Avenue, San Rafael. Following a brief reception, burial will take place at St. Dominic’s Cemetery, E 5th Street and Hillcrest Avenue in Benicia.